The herd horses at Mesa Verde National Park. The band is the most diverse on the park, with horses with deep red, white, black, and tan colors. A horse enjoys one of the few remaining green plants in Mesa Verde National Park near the Chapin Mesa museum. A remote-sensor camera captures horses chasing off an elk at a natural spring in Morefield Canyon in Mesa Verde National Park in 2014. Park biologists are attempting to control the horse population. A foal is spotted on the first day of spring at Mesa Verde Park. The foal is just a couple of days old. Horses roam the back country at Mesa Verde National Park. A new addition to the horse herd at Mesa Verde National Park nurses from his mother. Paul Morey, wildlife program manager at Mesa Verde National Park, shows a map of where the horses hang out in Mesa Verde Park. On deadline day for public comment, nearly 9,000 people sent letters demanding protection for horses roaming Mesa Verde National Park, which wildlife officials say are trespassing and damaging a significant archaeological site. “The horses of Mesa Verde National Park are part of the area’s natural landscape and history,” Deniz Bolbol, program director at American Wild Horse Preservation Campaign, said in a news release Monday. In December, The Durango Herald reported that Mesa Verde park rangers were asking for the public’s suggestions about how to handle a band of 80 horses and 12 head of cattle at the park, about an hour’s drive west of Durango. Under law, the animals are considered “trespass livestock” and were banned two years after Mesa Verde received the presidential designation in 1906 to protect what is considered some of the best preserved ancestral Puebloan ruins in the United States. Cristy Brown, a public information officer for the park service, said last month the escaped livestock has damaged important archaeological sites, drained resources for indigenous species and pose a risk to visitors. Because the animals eluded domestication long ago, escaping their enclosures and thriving on the arid land, the horses and cattle are legally considered “feral” instead of wild, and therefore do not qualify for certain federal protections. That leaves park officials with only one legal option, Brown said, which is to remove the animals. On Jan. 8, the wild horse preservation campaign submitted 8,982 letters on behalf of people who would like to see the “historic herd” of horses remain on the land, and their numbers humanely managed. That not being a viable option under current policy, David Temple, president of the National Mustang Association of Colorado, wrote that the removal of the horses should be done in phases, instead of all at once. Temple suggested using bait traps to limit the horses’ trauma, and leaving the animals on-site for holding and processing. He recommended organizing adoptions for the captured horses, and planting vaccines throughout the park to sterilize remaining bands on the land. Brown did not respond to a call for comment. The public comment portion is the second step in a nine-part process to decide how to handle the trespassing animals. 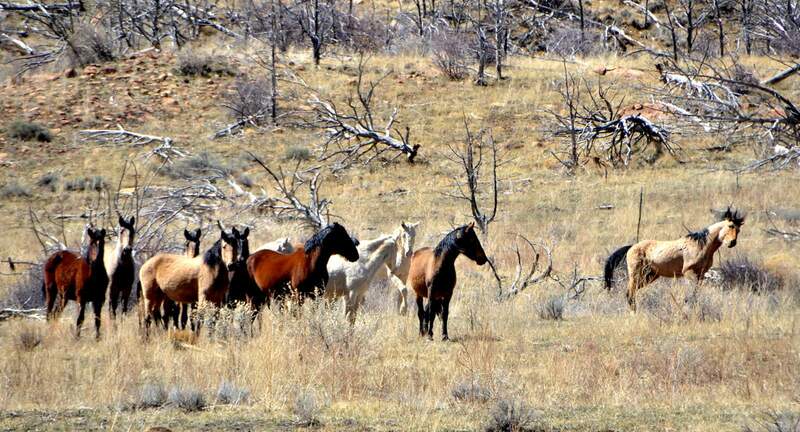 The herd became the center of controversy in 2014 when six horses died from dehydration-related causes, sparking protests at the park when rangers refused to provide the animals water – standard protocol for wildlife management on federal lands. The same concern was not shown to the fugitive bovines that graze at Mesa Verde, as far as documents released by the horse preservation campaign are concerned. However, Dustin Stein, “low man on the totem pole” at Stubborn Farm and Burk Beef in Mancos, had his own idea in a comment on the Herald’s Dec. 9 article. A remote-sensor camera captures horses chasing off an elk at a natural spring in Morefield Canyon in Mesa Verde National Park in 2014.